Galen Hanselman is a unique individual and so too are his books. Fly Utah! is the culmination of more than five years of research by Galen. It is an exciting book that provides information to help keep one out of trouble while exploring new areas. From the late fall through early spring all backcountry landings (except for ski operations) cease in most of Idaho, Montana and Wyoming. Galen now introduces Southern Utah, an area with more backcountry airstrips than Wyoming, Idaho, Washington, Oregon and Montana combined. Many of these strips are accessible when others "shutdown" for the winter. 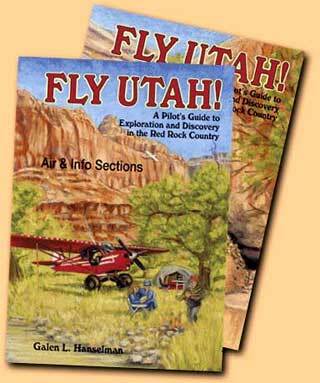 The book is a treasure trove of backcountry airstrips in what may be the last aviation frontier of the American West. Fly Utah! is about exploration and discovery. Explore ancient Anasazi cliff dwellings or squeeze through a thousand-foot deep, 2-foot wide slot canyon. Share a sandstone cave with a Fundamentalist LDS Saint (along with his 4 wives and 38 children). Search for the lost gold mines of the Spanish Conquistadors – far off the beaten tourist path. There are stories of airstrips, the surrounding environs and the interesting people that will make for a good, and often hilarious, read on a long night. Airstrips range from a challenging 500-foot overgrown strip clinging to a sandstone cliff to an exquisite 1,900-foot long, thin-air mountain strip at 9,200-feet elevation and several mild-mannered ones (and even a couple of paved strips) mixed in for variety. Lots of primitive airplane camping and a few top-notch lodges and resorts. There are 83 airstrips photographed in color. Photo 1 shows the airstrip overview. Photo 2 shows final approach. Diagram of airport layout. Text includes airport information, phone number (where applicable) and airport cautions. Galen uses the RHI (Relative Hazard Index) to provide guidance for the novice pilot in determining the suitability of a particular airstrip to his experience and his aircraft's performance capabilities. 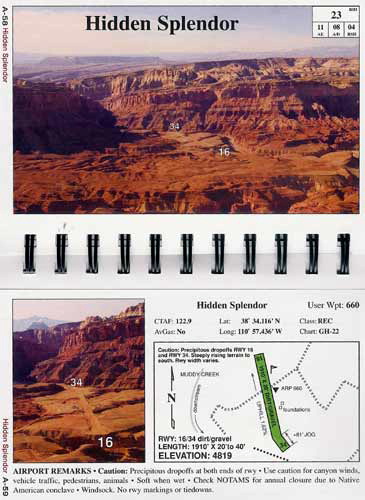 Each airstrip has a "Foldout Section" that provides two valuable pieces of information. The first is the "Terrain Elevation Model" giving the runway layout, elevations at each end, accurate scale and colored relief features. 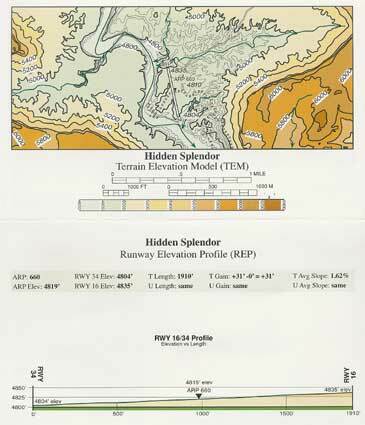 The Foldout Section also has a "Runway Elevation Profile" providing the elevation vs. length (and runway information on elevation, length, width and average slope.